There’s a better way to attract customers, he says. Companies that can make product “easier to buy, easier to find, easier learn how to use and then eventually dispose,” tend to retain its customer base for longer periods of time, Dawar says. “It’s in the interaction. It’s in how the customer buys rather than what we sell them,” he adds. This entry was posted in Customer Loyalty. Bookmark the permalink. 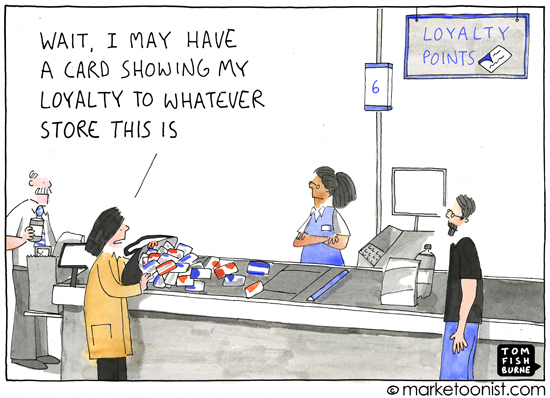 2 Responses to Are customers loyal to your brand or to your points? I think we had an exchange on Twitter the other day concluding it’s hardly ever ‘either – or’.. It’s in the mix. I think that applies here too.